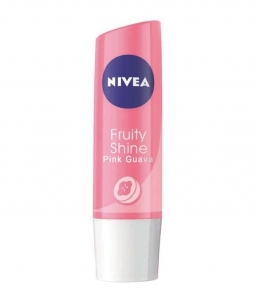 The Product Pink Guava shade or flavor totally reminds me of a pink guava fruit. It is a light reddish pink color, only for this one, has an added micro shimmers. The container is a white cylindrical plastic tube with a slanted top cover that is also pink guava in color. The total weight of this lip balm is 4.8 grams. This smells more like pink grapefruit than guava and this also has a hint of sweet taste too. This has a smooth and buttery texture. The retail price for this lip balm is around Php84 or almost US$2. Cherry flavor of it. This lip balm delivers a better shine compared to other traditional lip balms sticks, so I decided to try another shade. Pink Guava really suits its actual color as it really looks like the flesh of a pink guava fruit. On the other hand, this only delivers a tiny hint of color on my fairly pigmented lips. This gives a healthy pink color on my lips and the shimmers are not really visible unless I stare at my lips very closely. balms deliver. The glossiness of this lip balm is comparable to a one thin coat of a liquid lip gloss. My lips look even glossier with this when they were well exfoliated. This lip balm is very, very moisturizing. This applies smoothly on my lips. It feels slippery rather than emollient, although I still like it. I could feel the immediate moisture on my lips upon application. This keeps my lips hydrated, supple, and smooth. This also softens my natural lip lines, making my lips look smoother than the usual. although not as much as the first time I applied it. On the other hand, wearing this on a daytime when I am active, makes it last a little less longer. This could last for approximately three hours with moderate eating and/or drinking. However, this could easily dry out if I wear it outdoors due to its particularly thin consistency, added with the either harsh heat of the sun or strong winds that could dry out the moisture on my lips. On my final note, this lip balm feels very gentle on my lips. I never experienced lip irritations, itchiness, dryness, peeling, unusual lip inflation, or any allergic reactions from using this. this lip balm because of its ability to shine like a lip gloss. This lip balm may be on the thin side, however, I like the fact that it does not feel runny or watery at all. I like the slippery and buttery feel that it leaves on my lips that keeps them moisturized and soft. I would definitely recommend this to all ladies, most especially for those who have low tolerance for lip gloss. This has just the right balance between a lip balm and a lip gloss with an added hint of color for the lips. Pros Cheap, sturdy packaging, contains SPF 10, goes on smoothly, and very moisturizing. Cons I wish they did not add shimmers on this anymore because they do not show up anyway.